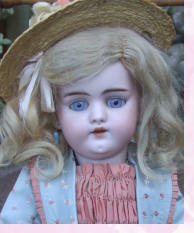 Very cute 1907 Jumeau with a perfect bisque head, blue paperweight fixed eyes and pierced ears. She has an old card pate and a replacement real hair French wig which really suits her. Just under her chin are two tiny speckles which obviously must have happened in the firing. I am just mentioning for accuracy although they hardly show. She has a late Jumeau body which is in very good condition with just a few rubs and a little bit of chipping to one hand. It still has a nice original sheen to it. She dates around 1907 and measures almost 18 inches.